The map was played in an earlier stage on the first map beta test day and there were several releases in IRC and a lot of people already commented on it and gave some appreciated suggestions. To name at least some: Drakker, eihrul, viruz, SomeGuy, shmutzwurst and more. Thanks! The map features a couple of different ways, an extensive mine section, some texture blending blablabla. viruz also contributed some geometry. for safety reasons, I put the final version in here, too. 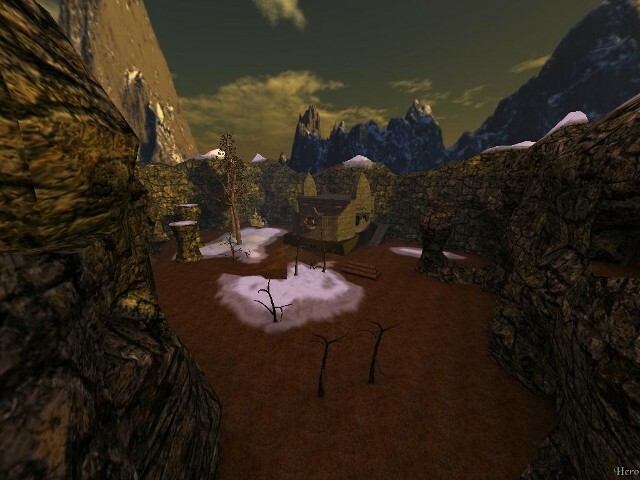 maybe one of the best ctf-maps ever. I really like the layout, and the mountains surrounding this map. You did a great job with the new texture-blend feature, looks great ;) Basically, the whole layout is done well...the mountains, the underground sections, the broken walls. - many of the textures (sorry, but i can't stand the old, brownish textures in sauer...just a matter of taste, i guess). I hope, one day eihrul will finally get rid of all old sauer textures, when there are appropriate replacements. - lights in the underground section (a bit too bright imo), every spot looks the same.